Wydarzenia muzyczne w 1892 roku. ↑ a b c d e f g h i j k l m n o p q r s t u v w x y z aa ab ac ad ae af ag ah ai aj ak al am an ao ap aq ar as at au av Paul Scharfenberger: 1892 (ang.). musicandhistory.com, 2016-01-15. [dostęp 2016-02-25]. [zarchiwizowane z tego adresu (2016-02-25)]. ↑ a b c d e f g h i j k l m n o p q r s t u v w x y z aa ab ac ad ae af ag ah ai aj ak al am an ao ap aq ar as at au av Paul Scharfenberger: January 1, 1892 – December 31, 1892 (ang.). musicandhistory.com. [dostęp 2017-02-17]. ↑ Ritter Pásmán, Op.441 (Strauss Jr., Johann) (ang.). imslp.org. [dostęp 2016-02-23]. ↑ La légende de Sainte Cécile, Op.22 (Chausson, Ernest) (ang.). imslp.org. [dostęp 2016-02-23]. ↑ Mass in E-flat major, Op.5 (Beach, Amy Marcy) (ang.). imslp.org. [dostęp 2016-02-23]. ↑ Werther (Massenet, Jules) (ang.). imslp.org. [dostęp 2016-02-23]. ↑ Le carillon (Massenet, Jules) (ang.). imslp.org. [dostęp 2016-02-23]. ↑ Mala vita (Giordano, Umberto) (ang.). imslp.org. [dostęp 2016-02-23]. ↑ The Frogs (Parry, Charles Hubert Hastings) (ang.). imslp.org. [dostęp 2016-02-23]. ↑ The Foresters (Sullivan, Arthur) (ang.). imslp.org. [dostęp 2016-02-23]. ↑ Blessed is He Who Smiles (Tchaikovsky, Pyotr) (ang.). imslp.org. [dostęp 2016-02-23]. ↑ String Quartet No.2, Op.5 (Nielsen, Carl) (ang.). imslp.org. [dostęp 2016-02-23]. ↑ a b Phoenix Expirans (Chadwick, George Whitefield) (ang.). imslp.org. [dostęp 2016-02-23]. ↑ La vie du poète (Charpentier, Gustave) (ang.). imslp.org. [dostęp 2016-02-23]. 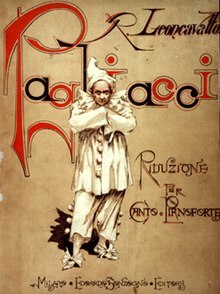 ↑ Pagliacci (Leoncavallo, Ruggiero) (ang.). imslp.org. [dostęp 2016-02-23]. ↑ The Lotos-Eaters (Parry, Charles Hubert Hastings) (ang.). imslp.org. [dostęp 2016-02-23]. ↑ Job (Parry, Charles Hubert Hastings) (ang.). imslp.org. [dostęp 2016-02-23]. ↑ Mlada (opera-ballet) (Rimsky-Korsakov, Nikolay) (ang.). imslp.org. [dostęp 2016-02-23]. ↑ I Rantzau (Mascagni, Pietro) (ang.). imslp.org. [dostęp 2016-02-23]. ↑ The Nutcracker (ballet), Op.71 (Tchaikovsky, Pyotr) (ang.). imslp.org. [dostęp 2016-02-23]. Tę stronę ostatnio edytowano 26 sie 2018, 00:54.